GPS rangefinders are shaping the future for getting those vital distances while on the green, and you desperately want one. You’re willing to spend the dough for an incomparable rangefinder that’s a notch above the rest on the market. But, how do you know which brand, what watch, or what handheld device will make the cut? I’m glad to say, you’ve come to the right place if you want to be as informed as possible before you buy. This Garmin golf GPS review is going to take a closer look at some of their best devices to date. Garmin is an well-earned authority in the GPS industry for their high-performing navigational products, so it’s no surprise that they deliver the same standard of quality when it comes to their golf rangefinders. They have high expectations and ambitious goals to be “the” leader in providing the most extensive and accurate navigational services, not only in the United States, but worldwide. With a company that’s certainly succeeding in their endeavors, you know you can trust that you’ll get the distances you need whether on the green or off. 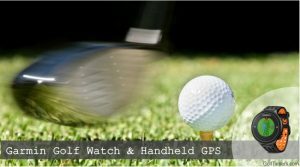 When you start googling for Garmin golf GPS rangefinders in the search engines, you’re looking for superior quality, innovative features, and excellent functionality. Because of Garmin’s reputation, we’ll expect to see it… and more. The following GPS devices are all equipped with a ton of features that won’t leave you wanting for more.